Cholesterol is an even more controversial topic than the issue of vitamin C. There are many respected experts whose views about cholesterol vary considerably and often conflict. We can only study their various views, apply critical thinking, and try to make sense of it all. The following indicates my current position which is based upon both study and experience. But before I get into it, If you believe that the medical profession has the best answers in regard to dealing with cardiovascular disease, prepare to have your EYES OPENED WIDE with this lecture by Dr. David Diamond PhD. He is an award-winning neuroscientist with a PhD in biology. He personally had horrible cholesterol numbers so his doctor wanted to put him on a statin drug. Instead, he researched the situation. His story is here. Cholesterol is found in every cell in the body. It’s needed for brain and neurological function, for building cell membranes, for hormone production, and it’s a necessary component of cell division. When exposed to sunshine on the skin, cholesterol makes vitamin D which in turn is used for many processes in the body. WE CANNOT LIVE WITHOUT CHOLESTEROL! Eggs have a lot of cholesterol. I had heard for decades that people with heart concerns should avoid eggs. A few years ago, when just developing my personal protocol, I asked Dr. Freedenfeld MD (a very experienced doctor and nutritionist in his 60s) about eating eggs. He said that over the years he saw no difference in cholesterol numbers in his patients in regard to eating or not eating eggs!! Already one standard “truth” challenged. Consider that our liver makes approximately 2,000 mgs of cholesterol per day in varying amounts according to the body’s need. Consider that many medical doctors suggest limiting eggs to a maximum of 3 eggs PER WEEK. If your cholesterol is “high” they may even say eat NONE. An egg yolk contains on average 187 mgs of cholesterol. 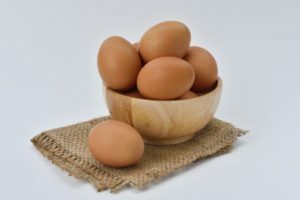 If a person eats 3 eggs PER DAY, that’s 560 mgs of cholesterol. In that case the body just makes that much less for the day, or absorbs less, so no problem. During the entire period of my recovery from cardiovascular disease (CVD) I ate 3 eggs per day. That way I received the benefits of one of the world’s most nutritious foods, while nevertheless overcoming CVD. Cholesterol is a type of fat. Fats cannot travel in the water-based blood stream by themselves. So they are combined with certain protein molecules so they can be taxied about in the blood. These combination particles are known as lipoproteins. LDL is called the “bad cholesterol.” Actually it has an important job. It is the primary carrier of cholesterol to the cells of the body. If it becomes oxidized then it becomes potentially harmful at which point there needs to be antioxidants present to neutralize it. Otherwise it may contribute to damaging the endothelium (inner arterial wall) which can lead to atherosclerosis. HDL (“good cholesterol”) carries excess or spent LDL (but not oxidized LDL) back to the liver. VLDL transports triglycerides and phospholipids to cells for energy or storage. For many decades the medical profession has been saying that “high cholesterol” (particularly high LDL) is the primary cause of heart attacks. That is not true. It can be a factor but is not a primary cause (except possibly if the type is high lipoprotein(a) which is usually not tested). At best, we can only say that extremely high cholesterol of the types usually measured may be a symptom of something not right. However, many individuals with “high cholesterol” live long healthy lives. Dr. Jonny Bowden shows studies in his book, The Cholesterol Myth, which indicate that people with high “total cholesterol” and people with low “total cholesterol” get heart attacks at about the same rate. You can also see his video lecture here. His bottom line: The standard cholesterol tests usually don’t mean much in regard to risk of heart attacks. In my own case, before beginning my recovery my total cholesterol was 259 which is regarded as “high risk.” Total cholesterol is determined by adding LDL and HDL and 20% of the triglycerides number. My HDL was very good (“optimal”), my LDL was “moderate.” And my triglycerides were optimal. So ALL of the factors that determine “total cholesterol” were NOT high risk, yet when combined they supposedly equal “high risk.” That seems pretty ridiculous, doesn’t it? LDL particle size. LDL particles range in size from large and fluffy to tiny and bee-bee like. If you have a lot of the tiny hard type of particles, they tend to be abrasive to the endothelium. You may have to request this test because many doctors do not include in their tests. When combined with high blood pressure, a high number of small particles can be even more dangerous. Lipoprotein(a), Lp(a) for short, is similar to LDL, but it is distinctive in that each particle is surrounded by an additional protein molecule called apo(a) which is characteristically very sticky and plays an important role (more about that below). A very high reading of Lp(a) on a blood test is warning of possible heart attack and should be taken very seriously. Yet most MDs do not test it! In my case, when I received my diagnosis of CVD the only cholesterol number I had that indicated significant trouble was my Lp(a) which was extremely high! What quells inflammation? ANTIOXIDANTS! The primary antioxidant in the blood for the job is ASCORBATE, i.e. : vitamin C.
Ascorbate also is necessary to make COLLAGEN which is necessary for repairing damage to the inner lining of arteries, and for maintenance! We humans, unlike most animals, do not make ascorbate (vitamin C) in our body. This is our major antioxidant (along with glutathione). Most people consume far too little ascorbate for adequate protection against inflammation. So in most cases the single most important root cause of coronary atherosclerosis and heart attacks may be insufficient vitamin C and poor diet. Contributing factors toward trouble cholesterol factors mentioned above, hypothyroidism, high homocysteine, and especially diabetes. Almost all animals DO make ascorbate internally, but do NOT make Lp(a). Humans (and the very few other animals) do NOT make ascorbate, but DO make Lp(a). There is a reason for that. Dr. Matthias Rath MD lectures here on The Origin of Cardiovascular Disease and lipoprotein(a). Without enough ascorbate, the endothelium loses structural strength and cells begin to separate. This is the beginning of scurvy and would mean internal bleeding leading to death – EXCEPT for the fact that we produce a material to repair the leaks when the need arises. That material is LIPOPROTEIN(a). Tests indicate that when ascorbate is low, the body increases the manufacture of lipoprotein(a). Remember that we humans must get ascorbate externally while most animals make it in their body. Ascorbate is so important that animals manufacture it at the rate of 9,000 mgs/day on average (adjusted for bodyweigtht) and if ill they make vastly more. Pauling and Rath surmised that our ancestors of several million years ago could also produce ascorbate internally as other animals do. At that time “we” lived in a region where plants and fruit containing vitamin C were readily available throughout the year. But since survival was difficult it became an evolutionary advantage to lose (via mutation) the mechanism in the liver that made ascorbate because energy is required to convert glucose to ascorbate. So those among our ancestors at that time who did not make ascorbate internally had a competitive advantage and became the only survivors of their species. But eventually our ascorbate-less ancestors spread to colder climates where, during the winter vitamin C was not readily available. Without adequate vitamin C scurvy would set in leading to death by internal bleeding within a few months. However, another mutation apparently occurred which enabled our ancestors to survive for longer periods of insufficient ascorbate. That mutation gave the body the ability to manufacture and use LIPOPROTEIN(a) AS A SURROGATE FOR ASCORBATE FOR SEALING DAMAGE TO ARTERIAL WALLS. This is a key point! This is why it is considered beneficial for people to have a level of Lp(a) in the 10-30 mg/dL range. Lp(a) particles are surrounded by a very sticky protein called apo(a). It serves as a sort of patching material for scorbutic cracks in the artery wall. With the arrival of spring vitamin C would again become available. It’s consumption (plus lysine from meat) would simultaneously lead to the removal of Lp(a) from the artery walls while simultaneously enabling the manufacture of collagen for proper tissue repair. Good to go, until the next winter! Modern humans have a different situation than our ancestors in regard to vitamin C and Lp(a). We are exposed to more toxins and environmental pollutants and generally consume less nutritious foods. Our population tends to not get enough vitamin C for optimal health regardless of the season of the year. The bottom line is that many of us eventually develop atherosclerotic plaque whether composed of Lp(a) or LDL or combinations of materials. Eventually these plaques can become so large as to block blood flow, or rupture, causing a heart attack or stroke. If warning signs are heeded atherosclerosis is reversible using the orthomolecular (nutritional) approach. Various 21st century nutrition experts, plus a few MDs who studied nutrition in depth after med school, are revolutionizing the science behind cardiovascular disease, and it’s about time! In March 2015, which was a few months before my GP doc and I decided that I “appear to be cured,” I had my fourth set of blood tests. It indicated moderate and optimal cholesterol numbers… but my Lp(a) was still high (184 nmol/L). But that is a 61% reduction! The literature says that there is an extremely wide variation in the amount of Lp(a) produced in individuals across the population. “The experts” also say that very high Lp(a) is inherited and probably cannot be reduced — although mine is clearly significantly reduced, apparently due to my protocol. So all things considered, I am not concerned that my Lp(a) number is still a somewhat high, especially since my other cholesterol numbers are in range, and since my health is much improved to the point that I can do aerobics and weightlifting on a par with men much younger, and with NO angina pain. But for maintenance I continue to take high doses of C along with lysine every day (along with other supplements). Functional therapist Chris Kresser also found that some of his clients were able to reduce Lp(a) through nutritional therapy. He presents an interesting YouTube discussion about it here. Owen Fonorow also cites incidents of successful reduction of Lp(a) in his book, Practicing Medicine Without a License, along with other interesting information about Lp(a). Dr. Chris Masterjohn PhD is a brilliant young nutritionist. He offers his insights about cholesterol here. Dr Brian Walsh ND presents a detailed explanation of the various types of cholesterol particles including Lp(a). SIDE NOTE: High doses of the vitamin, niacin, is said to be able to reduce both LDL and lipoprotein(a) by 20-30%. However, people who are undermethylated (as I happen to be) can only take relatively small doses of niacin because high doses in such types of people causes depression. A FINAL SUGGESTION: Very high Lp(a) indicates very high risk of heart attack, more so than high LDL or any other cholesterol situation. I urge anyone who wants to have cholesterol/lipid levels tested to find a doc who will include Lp(a) in the test (and LDL particle size and amount). Consider also that Lp(a) can be tested as particle numbers, or as “mass.” If you can only get one test done, the particle test (which measures nmol/L) is the more accurate indicator.